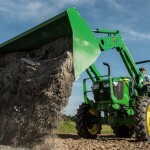 With the introduction of the 0 Series Round Balers for the 2018 haying season, John Deere is offering its first North American-built round baler precutter and the industry’s first 5-foot precutter baler. 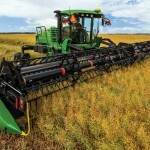 The eight models that comprise the new 0 Series Round Balers build upon the popular 9 Series Balers and include several new features that improve hay pickup and overall baling speed and productivity in the field. 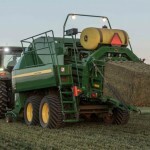 A new feature is the MegaWide™HC2 feed system that delivers faster hay intake and processing, which increases bale-making capacity per hour compared to previous and competitive models. 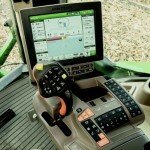 It also helps operators handle a wide variety of forage material and swath sizes with ease by offering a 2.2-meter pickup on both 4-foot and 5-foot bale models, allowing them to cover more acres per day. 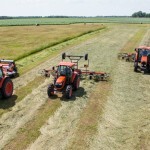 These machines will allow the operator to strategically place the bales where it is the most efficient for bale removal, while dramatically reducing the damage to crop regrowth from excessive field travel. 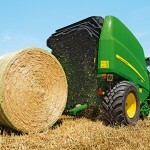 One or two bales can be dumped from the cart at the operator’s preferred location while the machine is baling.